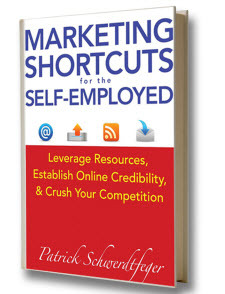 When Patrick Schwerdtfeger contacted PMC through our blog to offer an advance copy of his new book, Marketing Shortcuts for the Self-Employed, I immediately took the opportunity to speak with him. A brief phone conversation led me to learn interesting things about Patrick; earlier he had self-published a book, Webify Your Business, and his new one is essentially an updated version. His first book received such great reviews that John Wiley and Sons, Inc. picked it up and published it. Because Patrick was very down-to-earth, educated in entrepreneurship, and extremely willing to network, I have decided to write a book review for Marketing Shortcuts for the Self-Employed. This book shares valuable information, tricks, and advice for any self-started business. Marketing Shortcuts for the Self-Employed outlines a step-by-step marketing guide for building and growing a business, and focuses specifically on the Internet. Each chapter is about 2-3 pages long, easy to read, and user-friendly. The end of every chapter features a checklist so that after you read about the proper steps you should be taking in growing your business online, you can actually check off what you have completed. This tactic helps to push readers to become more proactive on their marketing initiatives and implement Patrick’s words of wisdom. There are also downloadable worksheets to accompany each chapter, giving readers the ability to get a more in-depth view on how to manage their marketing. The book is broken up into seven sections: Define Your Business Model, Plan Your Internet Presence, Build Your Website and Blog, Populate Internet Properties, Attract Qualified Prospects, Leverage Social Media, and Conclusions and Execution. You can think of each section as a step in building your company, which is then broken down into smaller, detailed steps (chapters) in order to achieve those goals. The first section helps to get your belief systems of your business in check, pinpoint your target market, and create a list of prospects. The most important topic that is introduced in this section though, is creating value for your customers. This is an idea that is used throughout the entire book in order to get the message across to business professionals that without value for your customers, you can’t build their trust. Consumer trust inevitably leads to sales. The next three sections deal with building a website, using Google’s resources to help enhance your website, and increasing your online presence. These chapters were most useful, since we are in the process of creating a website. I learned many things, including keyword research, how to create a positioning statement for the website, and how to create a conversation through the website. Let’s just say we may have new plans when it comes to the layout and our call-to-action because of these chapters. Other useful advice dealt with which Internet directories would be beneficial to use and how to get the most from your blog. The fifth section went into further depth of the aforementioned topic of attracting prospects for your company. Providing value in order to gain trust was the general idea behind each of the chapters, but Patrick gives more details on how to generate traffic. If you are curious as what pay-per-click advertising, posting articles online and writing press releases can do for your business, this is a great section to focus on. Now we come to my favorite section, Leverage Social Media! It’s always a pleasure to see how well a person understands the benefits of using social media for business purposes. Patrick covers the importance of community engagement, content and authenticity across social networks, and tells how they should be prioritized for your marketing strategy. 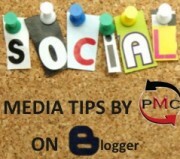 Additionally, Patrick covers the four social media powerhouses: Twitter, Facebook, LinkedIn and YouTube. Each chapter is filled with great tips and techniques for those business professionals who do not yet understand how to use social media sites from a marketing standpoint. He explains the four reasons to tweet, how to search for keywords, and how to create interaction on Twitter. On LinkedIn, he explains the power of precision emails and how to optimize your profile to get better Google rankings. Patrick covers the basic functionality of the Facebook profiles and offers advice on how to use Facebook Places to your company’s advantage. He explains how important effective communication is in regards to building a conversation about your brand. Patrick then continues to explain how marketing through YouTube is vital when trying to build a buzz. Videos always have the ability to go viral, and he goes into detail about how to promote your content in order to achieve that. I suggest this advice for anyone who would like to understand how to educate, entertain or shock your consumers. The most vital point made in the book though, is the return on investment (ROI) of social media. Patrick explains that the ROI is hard to be determined since each platform is a communication channel. He compares the ROI of social media to that of a cell phone, which is an excellent point. In order to measure ROI for your social media initiatives, a marketing campaign that features incentives is needed. By offering a discount or a free product or service, you will be able to measure how likely people are to take advantage of your offerings. This is what social media ROI is. Marketing Shortcuts for the Self-Employed is an excellent read for those who could use some inside advice on how to build and establish a web presence for your company. The book is more than just reading material; it provides a way to execute your business plan and marketing initiatives through its step-by-step features. Marketing Shortcuts for the Self-Employed will be sold in stores on the official release date of June 7th. For more information about the author and the book itself, visit the website today! Thank you for posting this super thorough review! I’m thrilled you enjoyed the book and sincerely appreciate the time you took to write this. No problem, Patrick! It was a great read and really helped us to organize our web strategies! Hope you had a great release day! I’ve read at least 40 books on social media marketing in the past two years. Yours is by far the best, not just for the information, but for the presentation. I actually understood what you wrote! I have shared your Channel 4 video on FB and am now following you a Twitter. Looking forward to your next project. Continued success to you. Richard, thank you for commenting! We enjoyed Patrick’s book as well; it was a great read. Thanks for stopping by our blog.